New ABC series “Whiskey Cavalier” aired a sneak peek after the Oscars on Sunday, bringing in 4.17 million total viewers. Last year, ABC debuted “The Alec Baldwin Show” after the 90th annual Academy Awards. That received 3.65 million, which means “Whiskey Cavalier” did 14 percent better. “Whiskey Cavalier” previewed to a 0.8 rating among adults 18-49. “The Alec Baldwin Show,” which had a later start time due to a longer lead-in Oscars, got a 0.7 in the key demo. The 2019 Oscars itself posted 29.6 million total viewers, which was up 12 percent from the prior year. Read all about those Nielsen returns here. Last night’s “Whiskey Cavalier,” which debuted well after primetime ended, is technically not the series premiere because of its very late time slot. The spy series will air the same episode on Wednesday. 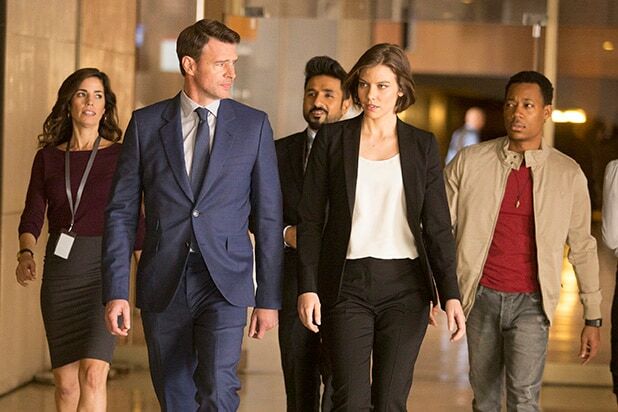 “Whiskey Cavalier” follows an FBI agent (Scott Foley) and his CIA operative partner (Lauren Cohan). Together, they embark on missions to save the world — but they have to put up with each other first. “Green Book” won Sunday’s final trophy — the coveted Best Picture Oscar. The film also brought Mahershala Ali another Best Supporting Actor statuette. “Green Book” won the Best Original Screenplay award as well. “Bohemian Rhapsody” actually won the most Academy Awards with four. Like “Green Book,” “Black Panther” and “Roma” won three Oscars apiece. 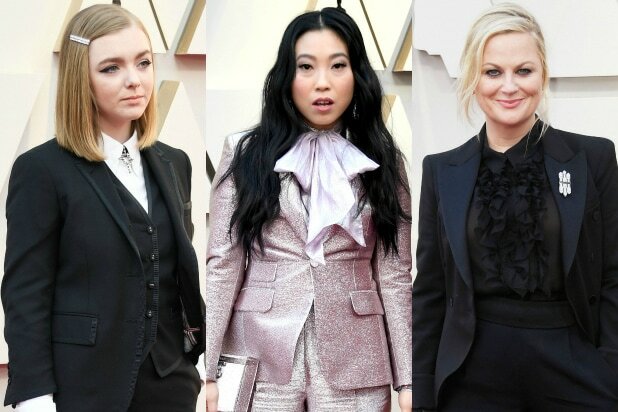 Pantsuits seemed to be all the rage among women on the red carpet of the 2019 Oscars. The comedian went all black in her pantsuit, and added a ruffled shirt and embellished brooch to the ensemble. Warren, who is nominated in the Best Original Song category for "I'll Fight" from "RBG," wore a white pantsuit with a statement necklace. The "Crazy Rich Asians" actress made quite the statement with her sparkly pantsuit and giant bow. Yes, it's not necessarily a pantsuit per se, but McCarthy looked glam in a black and white ensemble. The "Eighth Grade" actress has worn pantsuits to awards events this previous year, and the Oscars weren't any different for her. Her hairstyle reminded us a little of Gwyneth Paltrow in "The Royal Tenenbaums..."
The costume designer isn't wearing a pantsuit for the first time, and isn't a newbie when it comes to bold prints. This time, she wore a black and white striped set with an exaggerated black tie and black beret.